Bath Luve Review and GIVEAWAY!! My older kids all LOVE to take baths. They love to fill the bathtub with lots of toys and can spend so much time playing in the water. I am so grateful for this because it really makes getting them clean easier when they enjoy doing it. When they were all babies, it was a different story. It seems like with every one of my kids, when they were babies, giving them baths was such a miserable experience that they would cry through. We would try to put the baby wash cloths on them to keep them warmer, but baby wash clothes are way too small that they don’t do much! “Just submerge Bath Luve in water and drape over your infant. The natural design completely covers baby’s torso and stays put to keep them feeling warm and secure. The premium, soft touch fabrics snuggle baby and are gentle on the newborn’s skin. More enjoyment means longer baths, so the Bath Luve Buddy has arrived. This perfect companion offers a way for parents to continue to add warm bath water to the Bath Luve without removing it. The soft bath Luve Buddy is easily held in one hand by parents to dip and squeeze warm water onto the Bath Luve while also serving as a washcloth and a soft toy as baby grows. Bath Luve buddies are SO affordable! and only $6.99 each they are such a great investment! You can buy them at Bath Luve’s online store. 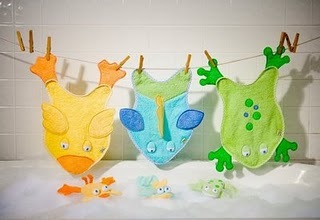 You can also buy Bath luve buddies, wash cloths and towels! Mandatory Entry: What do you “luve” about Bath luve!! How to Win – Maximize your chances of winning. Please Leave a separate comment for each entry. Only valid after you complete the first mandatory entry. If you are already a follower you still qualify just mention that in comment. Giveaway ends 5/23/2011 at 11:59 (PDT). Winners will be chosen via random.org and will have 48 hours to claim their prize. Winner will be posted on blog – if an email is given, they will be contacted. Next Post: Ebates: 12% cash back today at Old Navy, Gap, The Body Shop + more!